It’s true! I have the stick to prove it! And, yes, that’s a positive test. My friend, Christine, freaked me out when I showed her that pic. She said, “That’s a NEGATIVE!” But then I reminded myself that the directions clearly stated that a line in the circle is a POSITIVE. I’ve never been a fan of these stupid sticks. They’ve always made me sad. This is the first one that’s EVER been positive. In SIX AND A HALF YEARS, folks! I was supposed to go in for a blood draw Sunday morning to see if I was in fact pregnant. 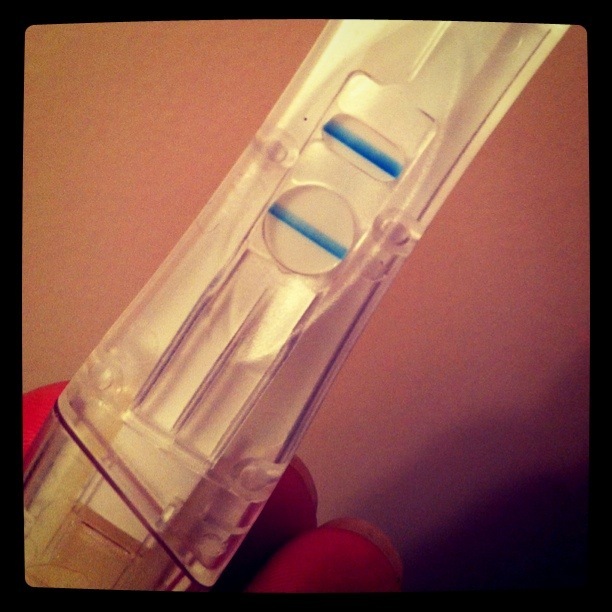 But, because I can’t stand suspense, I jumped the gun and did a home test Saturday morning. BIG MISTAKE. BIG, HUGE. When the doctor tells you to wait until a certain day to test and that it needs to be by blood, listen to the man. He knows what he’s talking about. The test was negative and I was devastated. I tried to hold myself together and take it like a big girl, but it wasn’t easy. Sunday morning rolled around, I went in for the blood draw, and prayed for the best. 4 1/2 hours later my nurse called with the results. Tears ensued. Lots of tears. Lots and lots of tears. The girl’s a thinker. Good thing because her momma’s a scatter-brained mess. I took another home test yesterday (above pic) just so I could have a positive test in my hands. It worked that time. I went in for more blood work today to make sure my hormone levels are increasing as they should. They are. Praise the LORD. I’m officially official. 4 weeks and two days official, to be exact. We’ll go in for our first ultrasound in two weeks to listen for heartbeats and see just how many bambinos are in there. We’re continuing to give God the praise for ALL of this. It’s such a miracle and we are so humbled to be a part of this story. Please continue to pray for a healthy pregnancy and healthy baby(s). i keep on thinking you’re having a boy…but i’m usually 95% wrong on guessing though. HOW EXCITING!!! i can’t wait to see that baby belly. i’ll make sure to make you feel super uncomfortable as i rub your tummy too long. kidding! or am i? OH MY GAWD!!! Awesome, awesome, awesome! You keep that bun (or buns) nice and comfy in your oven! So very excited for the whole fam!!! Prayers for you all! I am so excited! God does work in His time!! I can’t wait for all your posts on being pregnant!! Love you so much! Woo hoo!!!! Awesome, awesome, awesome!!!! I can’t wait to see Arle helping take care of her twin siblings!!!!!! oh.my.graciousness!!!! so stinking happy for you and yours!!!! can’t wait to see you all pregnanty and cute!!! As my pastor’s wife Grammy would say “PTL” (Praise the Lord!). I couldn’t possibly be happier for you and the fam! 1. tears. i’m so happy. 2. you being pregnant was clay’s high for today when we played high/low. 3. arle…holy moly, that girl cracks me up. toothbrushes?? Oh, Heather, I am in tears! I am so, so, SO happy for you (and Trav and Arle . . . ). Praying for a wonderful, healthy pregnancy for you. Looking forward to following your journey through this pregnancy! I am so excited for you – you have had to work a lot harder than most people for this outcome. I can’t wait to hear how many you have in there!! I am so thrilled for you! Continued prayers for a healthy pregnancy! Oh, and love Arle…she just cracks me up! I’m crying! I am so truely happy for you and trav and arle! What a wonderful famiily this little one (or ones) is joining! the toothbrushes are the most important thing to have when a newborn arrives. hahaha! you know i’m over the top excited. may or may not have cried through the whole process of your journey. but whatever. agreed….. tears flowing in the lindquist home… God is good. love you sister!!!! JOY! That is the feeling welling up & causing all these happy tears! Pure joy! Tears are streaming down my face! Girl…I know how precious that one positive pregnancy test can be….God be the Glory! We continue to pray for you and the bun(s) in the oven! I am crying, too….so, so very happy for you and your precious family. Have fun! I know you will enjoy every day of this pregnancy and then that new little one or ones…again. I am so thrilled for you all. Praying for the best of the best in every little thing….Hugs…. CRAZY happy for you!…CRAZY happy.. Such wonderful, happy news!! I’m tickled pink for you and praying for you all. Can you ask Arle where you go to buy another bedroom?! Prayers, love and best wishes to the whole family! God is Great! Wahoo, I am jumping for joy with tears running down my cheeks. Prayers and best wishes to continue! congrats congrats congrats! so happy for you and your family! Oh Heather, Travis and Arle that is such great news! Praise God from whom ALL blessings flow. I am so happy for ya’ll. well wouldn’t you know i teared up all over again reading your post. then the tears continued as i read the comments. and of course it was clay’s high of the day. love that. i can’t stop celebrating your adorable family and how God has and is knitting it together! i am like seriously smiling constantly about this long awaited, incredibly precious, amazing news! and how arle and adelaide will be the big kids and adelaide will have to take a break from feeing arle grapes because they will have a slew of small munchkins to care for while we gab. the end. cried in longing and frustration is stored up in a bottle somewhere up There. pour them out on us like the oil of gladness. (I don’t know about that last part for sure…..I’m just saying…..). Everybody at Harrisville loves, loves, loves you and we are full of prayers. Heather – Hi there! This is Christy Bue (was Christy Gray) from Teen Mania internship – you were my room lead:) Somehow, I think from facebook, I caught onto your blog and have been reading your stories….my heart has gone out to you and your family! From one Mommy to another, congratulations! I wish you every bit of health and happiness in this pregnancy! Being a Mommy is truly one of the must awarding and humbling experiences of life isn’t it! I saw that you were pregnant and just had to comment:) Waiting to here the continued wonderful news ahead! i could not be more excited for you!!! hooray! God is so good and so faithful. we will continue to pray for a healthy pregnancy! omg, omg, OMG!!!!!!!! I missed this post! This makes me soooo happy for you! Between the excitement I have for you and Ellie I am beside myself!!! yay yay and yay! praying for a healthy pregnancy and none of the crappy stuff that comes with pregnancy. :) Mabye I got all the stretch marks for you :) But REALLY, who cares about stretch marks…YOU’RE PREGNANT!!!!! AHHH!!!! Yay!!!!! :) Congrats Congrats Congrats! I can’t believe I’m JUST reading this. So excited for another little munchkin in the family. Arle’s comments are too cute about planning! Love you and are so happy for you!!! Heather I am so unbelievably happy for you, Travis and Arle! We will continue to keep your family in our prayers – I hope you have a wonderful and healthy pregnancy. Big HUGE HUGS!!!!! We have been in the midst of moving and without internet connection. So I am a little late in saying Congratulations Heather! I will be praying for you faithfully. I hope you enjoy every moment. I can not wait to read about your experience. Pregnancy is amazing! I have tears in my eyes. I am amazed how God takes care of his people. Not always in the ways we would plan, but He does have a perfect plan. Praise Jesus!